This solid wood Amish Computer Roll Top Desk comes fully loaded. The computer roll top desk features dovetail drawers with full extension slides for strength, convenience and functionality. The roll top tamber includes a lock as a standard feature so that you can safely store all of your valuables with the convenience of just one lock and key. A cooling fan in the roll top desk pedestal is also a standard feature, which provides added safety and comfort. Cord grommets help to keep your computer cords neat and organized. Raised panel sides are featured on the sides of the Amish computer roll top desk and optional on the back, which gives the desk added depth and brings out the beauty of the solid hardwood grain. One of our optional features for this computer roll top desk is the addition of secret compartments for storing your valuables! If you need added storage space, be sure to select the option of top drawers in our options menu. This computer roll top desk is available in nine different hardwoods and a wide range of finish options. 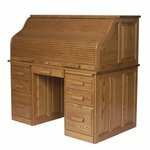 It is built by a master Amish craftsman and his sons who have been specializing in roll top desks for years. The superior quality in craftsmanship is evident in all details. It is built with integrity - a highly durable workspace that is both beautiful and functional. Customization is generally possible - please give us a call to discuss details or to speak with a furniture specialist who can assist you with stain samples or help you to place your order for this gorgeous computer roll top desk. 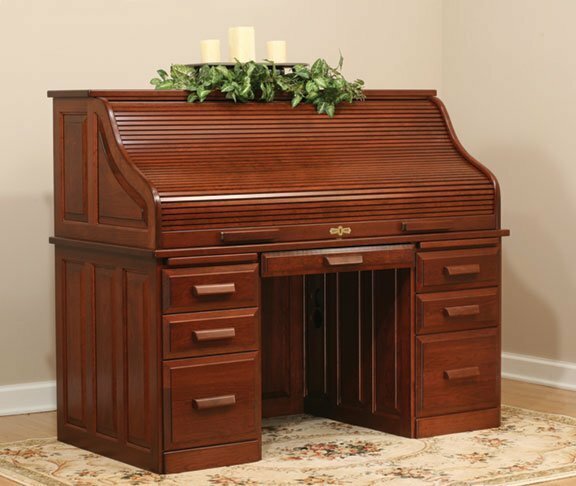 At DutchCrafters, all of our solid wood roll top desks are made by the Amish, handcrafted in America. This Amish made roll top computer desk is built to last a lifetime! Height Inside Desk at Middle: 17 3/4"